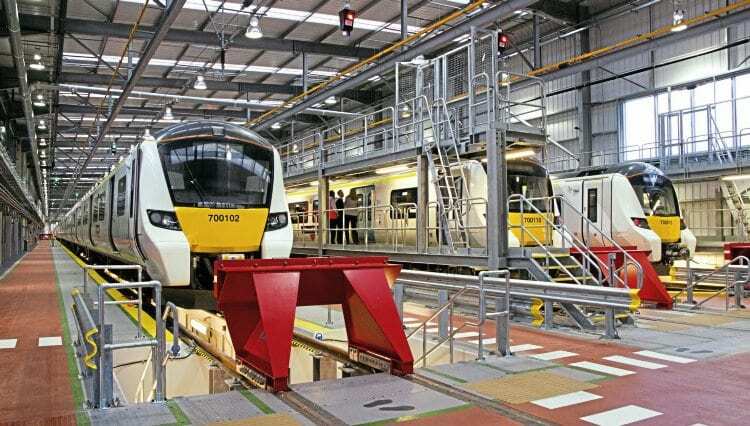 MAJOR changes at Govia Thameslink Railway’s Hornsey depot have been completed with the modernised depot ready to take on three new fleets of trains worth £1billion. Hornsey will be one of two new locations to maintain the Class 700 Thameslink trains when they operate from Peterborough and Cambridge through Blackfriars and beyond. Siemens Class 700 EMUs inside the new three-road shed at Hornsey. The upgrade is part of a £300m investment in depot facilities that has included the new facility at Three Bridges. The original Hornsey site was very constrained, had limited access and needed complicated shunting movements due to the depot having only one controlled emission toilet (CET) road. There was a need to keep the site operational and over the past four years stabling sidings were upgraded to 15 and expanded, with eight sidings now having CET roads. Power supplies have been upgraded and there is new onsite signalling with movements monitored by CCTV in the control room. The new sidings can stable 188 Class 700 vehicles.